In November 2015 Paul was appointed Musical Director to Selly Park Singers, a group of around thirty who meet in south Birmingham each week and perform twice each year with repertoire as wide-ranging as Byrd and Rachmaninov, masses, folk songs and jazz. Recent concerts have included Masses by Mozart, Haydn and Dvorak alongside works by Elgar and Bach; an afternoon of Cole Porter, George Gershwin and arrangements of songs by the King’s Singers; Choral Classics by Bach, Haydn and Brahms and John Rutter’s The Sprig of Thyme. Paul is the Director of Music to The St Ignatius Singers, a choir of twenty inaugurated in October 2016 who sing for services at various places around the West Midlands. Churches they have been to sing in recently include Christ Church, Coseley; St Mary’s, Handsworth; Holy Trinity, Wordsley; St Francis, Bournville; St Alban’s, Highgate, St Michael, Baddesley Clinton and St Michael and All Angels, Tenbury. Services have included Choral Eucharist, Choral Mattins, Choral Evensong, and Advent Carol Service and a Requiem. Rev’d Emma Stanford following the Tree of Light and Advent Carol Service at Coseley, December 2018. In February 2019 The St Ignatius Singers sang Choral Evensong in Coventry Cathedral. In July 2018 Paul directed the festival choir at the inaugural 3-Shires Festival. The large choir sang Choral Evensong which included Parry’s I was Glad and Noble’s Magnificat and Nunc Dimittis in B minor. Paul was Director of Music at St Paul’s in the Jewellery Quarter in the city centre of Birmingham for 13 years from September 2003. Unusually the choir of adults sang all year round, rather than termly only, alternating full Choral Evensong with Choral Eucharist. Alongside this weekly schedule the choir also sang an Advent Carol Service, Christmas Midnight Mass, Stations of the Cross during Passiontide, a Midnight Mass for Easter, a Requiem for All Souls and at various concerts. Under Paul’s direction St Paul’s choir sought to work collaboratively. 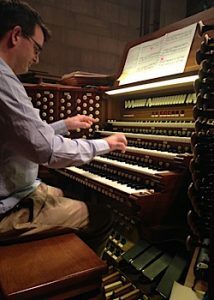 In 2014 a new unaccompanied setting of the Requiem was commissioned from Calum Carswell. The choir premiered this work on Remembrance Sunday. Other new works and first performances given while Paul was Director of Music included works by Fraser Wilson, John Warren (UK premiere of Prayer of Ignatius of Loyola just a few weeks after its world premiere, by Fourth Presbyterian Church in Chicago, USA) and John Barber (Inside: Psalm 121 and Bells of St Paul’s 2006, an anthem for choir, organ and handbells in celebration of the first anniversary of the new ring of 10 bells installed in St Paul’s in 2005).